Find Sentius prices and retail availability. 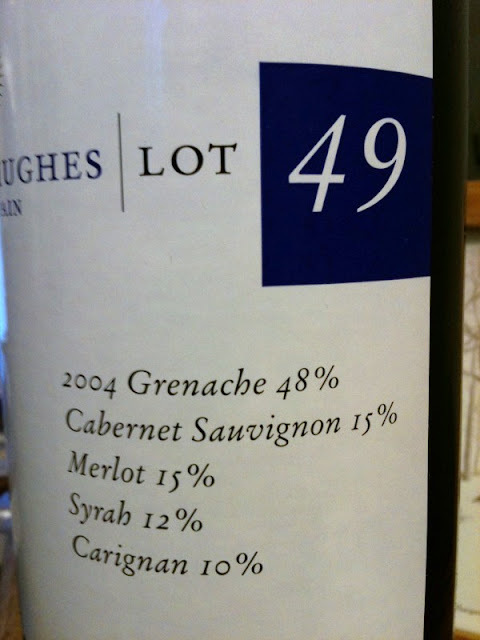 By way of background: Cameron Hughes Lot 49 is a Priorat DOQ blend from Spain, representing a mix of 48% granache, 15% cabernet sauvignon, 15% merlot, 12% syrah and 10% carignan, aged in American and French oak barrels. The 2004 vintage is finished at a hefty 14.5% alcohol. Based on the cork, I'm determining that this is a Joan Simo Les Sentius blend, which rated 89 Wine Advocate points, but which obviously didn't sell out under its own labeling. In the glass: Cameron Hughes Lot 49 Priorat (Les Sentius) shows as dark purple in the glass, opaque to within a half inch of the edge. On the nose: Poured cool with a brief decant and swirled vigorously, this Spanish blend shows a beefy-sweet perfumed nose, suggesting a sweet, deep sip. On the palate: The first element on the palate is a lush, tannin-laced red fruit middle, complete with mushy and dusty elements that move the fruit across your tongue. Red fruits sail into the roof of your mouth, held aloft by these creamy tannins. And the wrap-up: The finish is full and long, well-balanced. In summary: Overall, this is a deep and creamy, red-fruit-driven experience, held aloft by mature tannins. Rich and layered. Rates four stars on the five-star Spirit of Wine scale, and an awesome value. Unfortunately, it is sold out within the Cameron Hughes line. You may be able to find it under the Sentius label. The Wine Advocate 89 point rating for (what I believe to be) this wine was accompanied by the following remarks: "The 2004 Les Sentius is 48% Grenache, 10% Carignan, 15% Cabernet Sauvignon, 12% Syrah, and 15% Merlot from vines planted in 1999. The wine was aged for 15 months in French oak. Purple-colored, it offers an attractive nose of cherry, raspberry, mineral, and spice box with a touch of alcohol poking through. On the palate the wine is structured and tannic with ample fruit but narrows out in the finish." Following a two-day decant under vacuum in a partially-filled bottle: the aromas seem even more perfumed and beefy now. Fruity acids now come out to play with the tannins. Will take all the air you want to show it. Updated review, two years later, February, 2012: Remains consistent in the glass, with some of the purple converted to magenta. A more shy nose, though still deep. The palate is now soft red fruit, still fresh, with a nice wash of furry tannin whispers. Brilliant and sweet red currants. Still quite stunning, with acids and tannins remaining in charge as the red fruits remain aloft for the lengthy finish. Crazy best value. Following long decant, full day kept cool in partially filled bottle: Deep oily aromatics. Palate has the same intriguing red fruit elements, with a nice slick undertone. Another updated review, another year and a half later, September, 2013, now nine years from vintage date: Dark magenta now. Some rubber balloon funk coming into the nose now (that will blow off quickly), which shows underlying bold fruit. The palate is entirely consistent and strong. This is ready to drink now, at just about a decade from vintage date. Another updated review, another year and a few months later, now 10 years from vintage date, December, 2014: Shows clean bold fruit and cedar in the nose, definite elements of Barossa shiraz! No funk. Bright red currant fruits along with the deep, full blackberry. Easy four stars. No sign of age! We just sold the last of our Lot 49 Priorat DOQ. Thanks for the good review. If you liked this wine, try lot 98 Campo De borja GSM. Thanks Jake. You've got some interesting offerings. Feel free to send review samples along for bottles with good retail and online availability. See link at right for info.